Chelsea star Willian has dismissed the report he wanted to leave Chelsea during the summer transfer window. 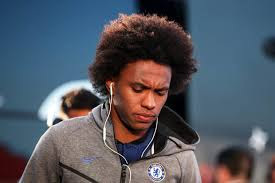 Willian was linked with a move to both Barcelona and Manchester United during the transfer window and report even has it that he had a chat with Manchester United Coach Jose Mourinho concerning moving to the club. Willian who has so far been impressive for Chelsea this season in all their four games has however come out to dismiss the report and said it was all a rumour that he was pushing for a move out of chelsea and reveal he is happy to stay in the club and wants to stay longer. 'When I arrive my plans was to stay here as long as possible and now I am here five years I hope to stay five more! Willian has just two years left on his contract and the club will soon start planning to discuss a contract extension with the Brazillian. Do you want to see Willian remain in Chelsea?